Critics have hailed it as ‘irresistible, ‘flawless’, ‘a brilliant musical about a brilliant man’ and ‘full of enthusiasm and impact’. Powerful and uplifting – Madiba the Musical is a soul-stirring celebration of the visionary leader Nelson Mandela. 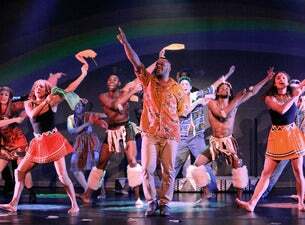 With its pulsating African dance, stunning visuals and inspiring songs, this epic musical charts the struggles and racial conflicts amidst the activists unyielding crusade for love, reconciliation, and freedom. The show about destiny and desire springs to life with vigour and heart, and looks to forgiveness beyond the hate. It is a story of forbearance, passion and hope in the fight for a brand new world of modernity and freedom.